Bristol based online suppliers and exporter worldwide, offers popular British Brands from the UK. 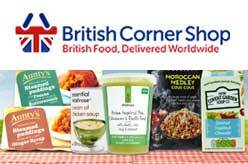 Over 10,000 British grocery products available online. Order 24/7 For Worldwide Delivery ! Brands : Branston, Cadbury, Heinz, Aptamil, Cow & Gate, PG Tips, Marmite, Hipp Organic, Yorkshire and more. Bristol BS37 5NZ, United Kingdom.